Kerbal Space Program's first expansion adds excellent tools for scripting your own missions. KSP's sandbox gets bigger by focusing on what makes it a great PC game: flexibility, freedom, and random explosions. What is it? A history-themed expansion pack for Kerbal Space Program. Kerbal Space Program's freeform rocket-building sandbox has attracted modders since the beginning, and after seven years they've crafted hundreds of additions—everything from planetary bases to ion drives. In this environment, what can Making History, KSP's first official expansion, offer players that hasn't already been done? Not its collection of real-life spacecraft, which is a curious inclusion given that space history is one of the most popular subjects for mods. For example, the expansion offers a pretty good version of the famous Apollo 11 lunar lander module, but this mod has had a picture-perfect recreation available since 2014. The expansion adds the slender, tapering Soviet R7 rocket fuel tanks, but this mod made them available almost four years ago. All of these new additions retread ground covered by free mods for years and years. No, in keeping with what already makes KSP great, Making History's best addition is not an object, but a tool—a new way to experiment and create. The Mission Builder, which players can use to script and plan missions and stories using simple drag-and-drop tools, makes the expansion worth the money. For most of its life, KSP was a sandbox game. The only missions were the ones I made for myself: Hey, I should go to the Mun. I should build a Munbase. Contracts that reward players with money, science, and prestige in career mode were a late addition, and I've always found them to be the weakest part of KSP. Instead of focusing on big-picture goals like taking my first steps on distant planets, contracts have me duct-taping and kit-bashing single-use spacecraft to take a new landing gear to a certain height and speed, checking off a box to get paid. 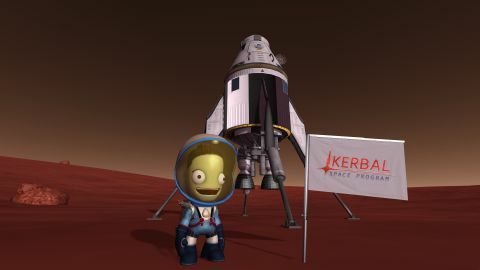 Contracts provided some goals and direction in the open world Kerbal arena, but they were never about telling stories. The new Mission Builder and History Pack (a set of pre-built missions based on space race launches) change that. For the first time, I can fly and build missions that follow a script. In one of the first included missions, my Soviet spacecraft is suffering from a cascading electrical fault, and my only hope is to rendezvous with a nearby satellite and use its diagnostic systems to reboot. As I carefully fly over to the satellite, random systems explode, and my time begins to run out. After I finally get the computers to reboot, mission control throws me a curveball: Is there any way I could deorbit that satellite so the R&D team can see how get a look at the computer logs? Suddenly, I'm on a white-knuckle solo flight home in a satellite that wasn't meant to fly. Thanks to Making History, space can be an inherently dangerous place again. For long-time KSP players, improvisation and surprises only happen as a result of our own incompetence. Thanks to Making History, space can be an inherently dangerous place again: random failures a la Apollo 13 might cut a mission short; a freak micro meteor shower might puncture all of my solar panels, leaving a deep-space mission stranded until help arrives. All of these variables are available to use in the Mission Builder, which is an excellent tool for scripting your own stories, as if you're a sci-fi dungeon master running a deep-space tabletop RPG. Everything in the Mission Builder is drag-and-drop. To script a mission to the Mun, drop a Spacecraft Launched icon and a Spacecraft Landed icon and draw a line to connect them. Start at Kerbin, land at Mun. Drop a score bonus and a time limit, and draw new lines to wire them in to the script. Start at Kerbin, land at Mun in less than 3 days. Zoom in a bit and tweak a menu option to make the objective more specific. Add a scripted event. Give the player a choice between salvaging precious data and saving a stranded Kerbal. Start at Kerbin with a ship weighing less than 40 tons, land at Mun in less than 3 days and plant a flag in the East Crater and your thruster tanks exploded so you can only thrust to the left. Making History is great for the making, not the history. The building blocks are simple, but there's no limit to how deep you can stack all the Mission Builder's scripted emergencies and radio messages. I've been astounded by KSP modders' technical skill and devotion to historical engineering minutiae, and I'm sure that will all be applied here—perhaps with minute-to-minute recreations of Apollo 11 driven by actual radio transcripts. These tools are powerful enough to do that. There's also a lot of comedy baked into KSP. When you're telling a story about the Kerbals—slapstick doofuses that they are—the explosive incompetence of amateur rocket designs makes it hard for KSP not to be funny. Mission write-ups are common on the subreddit, and these chronicles, especially those that revel in constant missteps, are often charming and sweet. Given tools to catalog, share, and have other players replay their epic missions (or painful failures), this same community could become expert story scripters as quickly as they've become expert rocket scientists. Despite the huge number of free mods, KSP's developers found a way to make their expansion valuable: They built a new set of tools that the community hasn't provided for itself. The KSP community is fantastic, and more ways to create and share space adventures is exactly what it needed. For the price, it's nice to also get the big dump of new, historical parts, but Making History is great for the making, not the history.